Fresh talks to try to end pay strikes by college lecturers have ended without agreement. Lecturers have already gone on strike twice and another walkout is planned for next Wednesday. The EIS Further Education Lecturers' Association (EIS-FELA) is calling for a "fair" cost-of-living pay rise. But colleges say many members of staff have also received significant rises because of moves to standardise pay nationally. The EIS-FELA and Colleges Scotland both expressed "disappointment and frustration". The union says lecturers are being offered consolidated rises worth a total of 2% covering three years - but employers say many will get more. Employers say any rise has to be affordable. EIS-FELA president Pam Currie said: "Despite repeated attempts to engage the management side in meaningful negotiation, talks ended at lunchtime today without progress being made." EIS-FELA negotiators sought to meet again ahead of further strike action on Wednesday 6 March - the third day of strike action since January - but management was unable to commit to a meeting. The union now plans to escalate action. 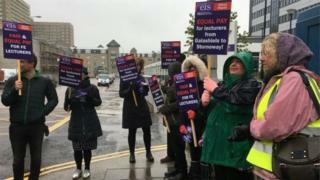 Ms Currie added: "In the absence of an improved offer, EIS-FELA will open a statutory ballot next week for action short of a strike (ASOS) in the form of a resulting boycott in addition to further strike days. "We believe that management are cynically allowing further industrial action - at the expense of our learners' education - while making no effort to resolve the dispute." Colleges Scotland has argued that money is tight and a bigger pay offer will mean bigger cuts to pay for it. Spokesman John Gribben said: "Colleges have now made six offers to the EIS-FELA but, once again, they have decided not to accept a great deal. "The overall pay rise from harmonisation and the additional pay offer on the table represents a national average increase of £5,000 - or more than 12% for college lecturers." He added: "The EIS-FELA has demanded parity on pay with support staff workers, so we have extended the pay deal to run until September 2020, in line with the support staff deal. "But they are cherry-picking from the deal and won't agree to job evaluation, as support staff have. "The overall costs of lecturers' pay and improvements in terms and conditions from 2017-20 is £65.8m compared to £37.1m for support staff over the same period." Colleges Scotland argues all lecturers' terms and conditions have been improved or safeguarded. It says they now have 62 days' holiday each year and have seen a reduction in class contact time to 23 hours per week. Some senior figures in the college sector believe the union may be hoping the Scottish government will intervene and give colleges more money to fund an improved pay offer. However, colleges do not expect that the government will do this.